The ONE Group has three different devices available. 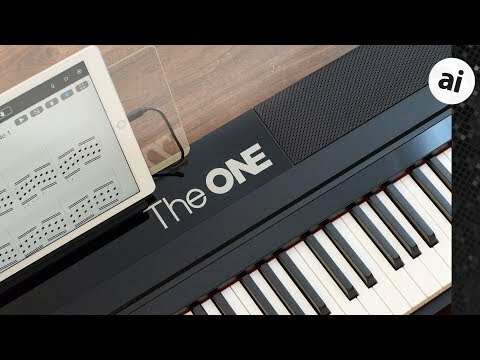 The ONE Light, The ONE Smart Keyboard Pro, and The ONE Piano. In this review, we tested out the pro version, which falls squarely in the middle of the pack. The pro model has the capabilities to grow with the performer. It has a clear emphasis on beginners, but can help even more seasoned players learn new songs quicker, and even over time build skills necessary for actual performances. The ONE Smart Keyboard Pro has a substantial weight. It is an 88-key keyboard which accounts for some of the weight, but most can be attributed to the massive built-in speakers. Speakers are distributed to the right and left of the keyboard, with the iPad/music stand in the center. Around back are the ports; aux in/out, sustain pedal input, a USB B port, and the power input. Depending on which device you are to be using (iPad or Android tablet) a micro USB, Apple 30-pin, or Lightning cable will plug into the USB B port. It is a bit of an odd combo, USB B to Lightning, so if anything does happen to the cable, it could be difficult to replace. On the front of the keyboard, on the left side, are a pair of headphone jacks. These 3.5mm ports are great to connect headphones and practice in silent. With neighbors sharing walls, this came in handy for late-night jam sessions. Only two physical controls can be found on the keyboard itself, a multi-function knob and a power button. Rotating the knob adjusts the volume while depressing it changes the instrument voice on the keyboard. Piano keyboard keys usually come in one of four types. Non-weighted, semi-weighted, weighted, and progressive weighted. Most low-end keyboards fall into the non-weighted category. You can tell immediately by the lack of almost any resistance as you push down a note. Semi-weighted use springs and has a bit more feedback as you play. Most "pro" level keyboards will be categorized as weighted. These attempt to mimic the hammer action effect that you get with real acoustic pianos. Only high-end keyboards will have progressively weighted keys. On acoustic pianos, lower notes have more resistance than the high notes. So some top-tier keyboards will have graded (or progressive) weighted keys. Where the weight changes depending on where the key is on the keyboard. The ONE Smart Keyboard Pro has great feeling weighted keys. They aren't graded, but they feel great while playing nonetheless. Another pro feature is the 128-maximum note polyphony. That is about as good as you can ask for on a keyboard. As a quick background, polyphony is the number of individual notes the digital piano can produce at one time. A good way to look at it is 32-note maximum polyphony is terrible. 64-max can be acceptable. 128 is usually seen as best and anything above is more gimmick than substance. What we usually see is "beginner" keyboards, intermediate keyboards, and pro-level keyboards. As the musician learns to play, they need to upgrade their keyboard. Pro keyboards often don't have beginner features. Beginner keyboards don't sound great or lack the features needed for professionals to even consider one. Using an iPad, the developers can build a lot into the app instead of the keyboard itself. It also allows them to add more videos, music, and functionality in over time. iOS integration is one of the largest selling points for this keyboard. It is really what takes an otherwise solid keyboard, and makes it amazing. Inside the app is a robust sheet music catalog (4000+), over a hundred instructional videos, and many games. There is also a large settings area where your recordings, favorites, purchases are all stored. It is also where you can change the voice of the piano. Multiple voices are even supported at once, known as split voices. In total, there are over 128 different instruments that can be chosen for the piano. Clearly aimed at beginners, lessons make it easy for anyone to jump in and start playing songs in literally minutes. There are games that mix up the learning style by having the notes fall down the screen in Guitar Hero-type fashion. Compared to how I learned how to play piano, this seems much more engaging and fun. Assistance continues through the sheet music. As notes are played, the cursor on sheet music follows along. This makes it extremely easy to find your place in the music but also prevents the musician from having to move the sheet music on their own as they reach the end of a page. Many pros already defer to the iPad to store their sheet music. The ONE Smart Keyboard Pro's ability to help scroll down the page as they play makes it even better. Along the back of the keys is a row of LEDs, to light the keys up as they are played. The keys themselves don't light up, but a row behind the keys does giving far more than enough illumination to get the point across. This is a great feature for beginners. As the music is played, each note is highlighted, helping the musician identify which note to play. Beginners can use this to start playing right away. It is extremely gratifying for younger users who can play some basic songs after just minutes on the keyboard. Pro players can use this to see where they keep getting tripped up and develop muscle memory for more knuckle-busting riffs. In the app, you can turn off the light completely, use both hands, or focus just on one. Killing the lights is handy if dealing with a particularly difficult series on one hand and you can practice it many times in a row without worrying about the other hand. As far as obtaining the sheet music, there is a large catalog of free music. But, if you are willing to pay, there are a lot of popular songs from film scores to pop hits. Prices are usually around $3.99 for most arrangements. We were very impressed with the volume, fullness, and quality of the onboard speakers. Professionals may prefer their own amps (which work with the aux out), but we expect most users to rely on the built-in speakers. The ONE Group used 10 layers acoustic samples and 16 bits stereo sampling accuracy for their grand piano audio. The grand piano is going to be the most important sound on any keyboard, and the sampling sounded pretty amazing. We looked at the quality of the keys earlier in this review, and in use, they work quite well. Like many keyboards out there, we noticed a couple dropped notes when going for some very light, repetitive staccato notes but that is hard to avoid. In our many, many hours banging away on this keyboard, it was responsive and replicated the sound selected well. Even having a few professionals play it, they were also very happy with its performance. We really enjoyed playing The ONE Smart Keyboard Pro. It offered a lot of versatility and features, while still appealing to beginners. It may be hard to justify spending that price on a beginner alone, but there is clearly a need and an audience for a keyboard like this. Lighting up the keys while playing is an amazing learning tool, but it can't replace teachers completely. It is too easy to get caught up in the lights, and by the end, you learn more how to follow lights and muscle memory than actually how to read music. While I was practicing with the keyboard, I found my eyes drifting down to look at the lights. I knew where the notes were, but couldn't stop following the lights over the music. It was reminiscent of when closed captions are on a movie. I can hear what they are saying, but still end up reading the lines the whole time anyway. That is why being able to turn off the lights and read the music is crucial to becoming a real pianist. The ONE Smart Keyboard Pro is a lot of keyboard, and it may not be for everybody. The ONE Light is more affordable, but loses out on 27 of the keys, has slightly weaker speakers, and doesn't have weighted keys. For those going all out, The ONE Piano is a standalone unit, meant to live in your home or studio, rather than being portable. All three can be currently found on Amazon. The ONE Light will run you $299, The ONE Pro is $799, and The ONE Piano is a cool $1,145. It offers weighted keys and offers a much better generated vs sampled sound - all on board - and offers a superior quality, from a manufacturer that has been doing this for years. Pretty expensive, and no pitch bend or modulation wheels. I bought "The ONE Light" off Kickstarter a few years ago. Never played piano / keys before (some guitar and violin). It's a great keyboard. Like the article says: the polyphonic and weighting are great. Within a week I was playing some 'popular' songs. My wife is not musical at all - and she was also able to learn to play a little. But the 'app' previously integrated with HDPiano - which I really liked. When they removed the HDPiano integration I stopped using the app and just used HDPiano web site via Safari on the iPad with the keyboard. i.e. : the lights in the keys were not that helpful after even a short time. So I still play it a bit - and my 18 month old bashes the keys - but I'm not using it like I thought I would (with the app to learn). For the kickstarter price there wasn't anything else on the market that offered 128 note polyphonic and weighted keys - I'm very happy with it - but it's not the "pro" model - and I didn't see anything in this article that would encourage me to go "pro". Roland is very nice, but there are some differences between the two. First, the Roland model you show obviously has a built-in stand and progressively weighted keys, which are both very nice. However, it only has 11 sounds, which depending on the performer, could be a big problem. It also isn't portable. Portability is hard to do, so to make a portable 88-key keyboard can add to the cost a bit over a stationary keyboard where size isn't as much of a consideration. There are also small other differences like the split and multi-voice features that The ONE has over the Roland. They are still there on the Roland, though not as robust. Clearly, the biggest thing with The ONE is the ability to learn piano quicker or learn new songs. The light up keys, the app integration, all add up and there is really nothing like that on the Roland on. There are some learning tools, but not of the same caliber. If you have no interest in trying to learn new stuff or use the light up keys, then it doesn't make The ONE that much better than any other keyboard. Speaking as someone who has invested in hundreds to thousands for whatever pro-level instrument meets my needs over the years... anything that jump-starts musical interest is welcome. The article mentions the two physical controls on the instrument, power and a rotary encoder. I presume volume to be independent of the app, but what about instrument selection (via depressing the encoder)? Must you have your mobile device connected to access those other sounds? Without a connected device, does the piano sound boot up by default? Thinking "in reverse", let's say you've succeeded in learning to play using this instrument, and you've amassed a library of sheet music via the app... how portable is this investment? Will the sheet music portion of the app function in the event you are traveling, or decide to move up to a more advanced instrument? True, you’re correct that they are essentially different products with a lot of overlap. I guess trying out both is best. Guess I’m more old school by taking music lessons and a more “traditional” piano. Lessons from a human being work better for me. However portability can be solved with some of the other Roland products out there in the same price range. And when it comes to sound it depends if you are going for quality vs quality. Roland’s sound engine for their piano products is amazing: the sound is synthesized from the group up and they do it very well. I’d rather have 11 great sounds versus hundreds of mediocre ones (especially considering midi can trigger any sound anyway). Does it work with Garageband? good review and nice playing!